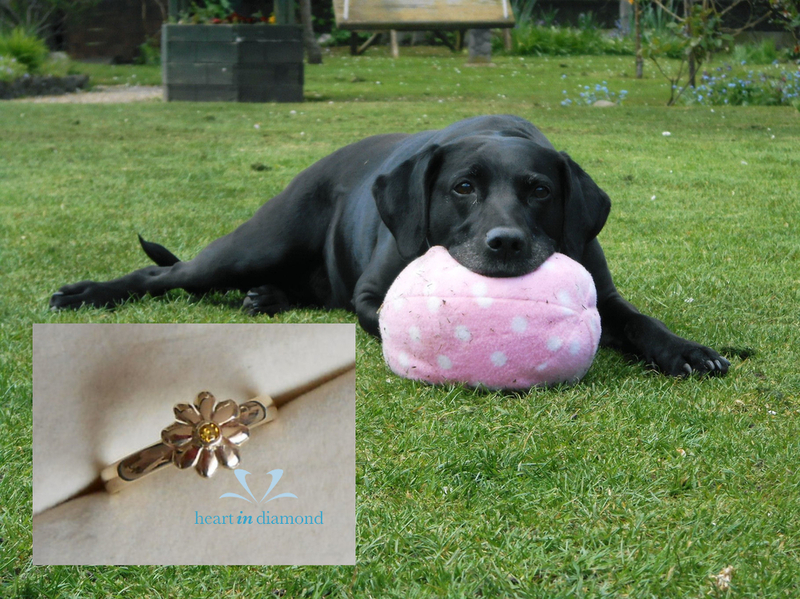 The diamond itself is stunning & the gold daisy ring is exactly what I wanted, subtle enough to enhance the diamond but to also have it in the shape of a daisy after the diamond’s namesake, our lovely Daisy. Please send my thanks to Simon at Stuart Bullock & Son Jewellers, he created something that was always in my head but so difficult to explain. I also would like to thank yourself for your help every step of the way especially your part in communicating to Simon what I wanted! I cannot praise your company enough. I can only imagine some of the stories you hear. Whilst our story isn’t yet sad as we still have Daisy, the fact that she has kept me company through some very dark scary times I find some comfort that when the time does come I’ll still have part of her with me. I’ll be forever grateful that your company made this affordable for people like me, I am telling all my Dog walking friends how amazing this experience has been!